A team of adventurers venture into the deep, dark woods; glory and treasure are their aim. But to these folk, a warning. In these woods there are dragons, and you must be at your very best in order to defeat them! 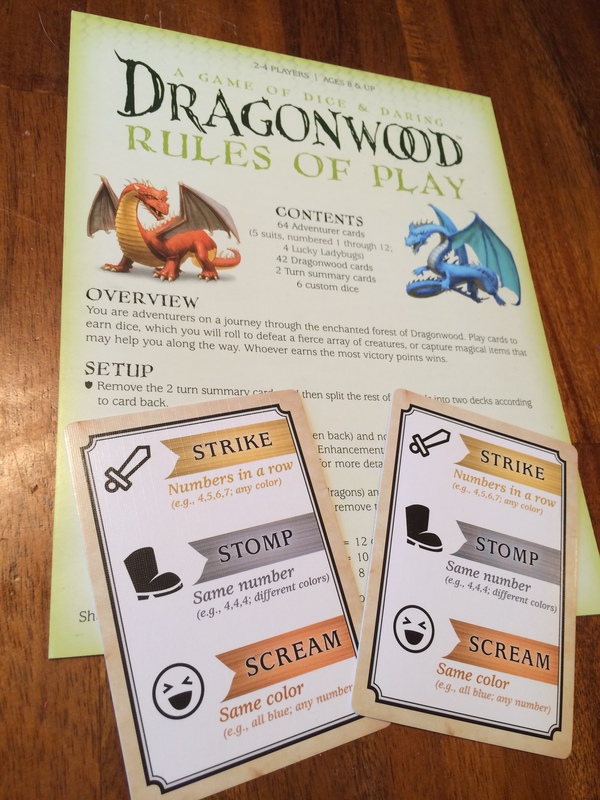 Dragonwood is a game of dice and daring. You draw your adventurers and roll to see if you slay the monsters, or if the monsters get a hit on you. Are you sure enough of your bravery to try? Capture the creature or grab one of those enhancements? 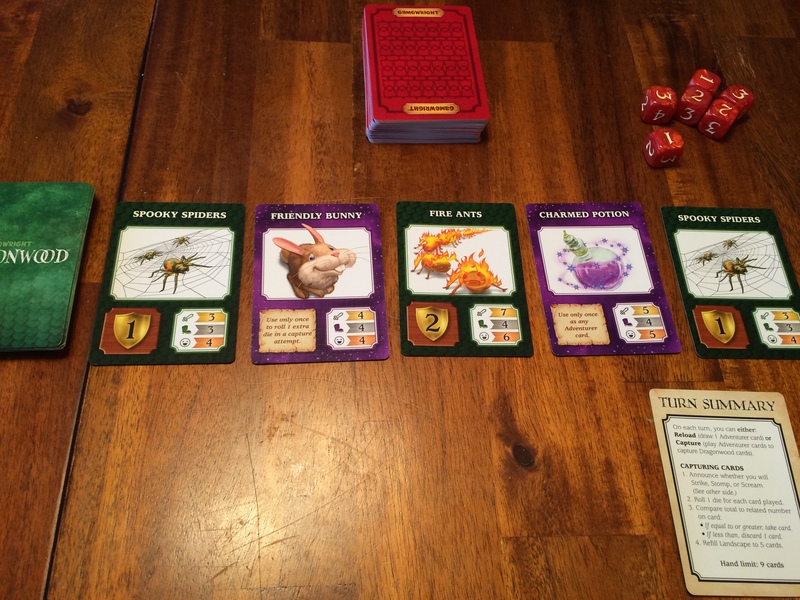 Up to 6 cards can be played this way in order to capture a creature to add to your victory point pile, or to add an enhancement that will help you out later on in the game. For each card you play, you take a die. The total rolled between all dice must be equal to or higher than the related value on the card. Strike, Stomp, and Screams each require a different total. If both Dragons are defeated, or if you have gone through the adventure deck twice, the game is over. The person with the highest amount of victory points is the winner! Dragonwood is a fun, light game. It is easy to pick up and play, and within minutes you will be immersed in the game. I had no problem teaching even as we just jumped right in to playing, which seemed to work out well for everyone. Helpful player aids include a list of the things you can do, so even if someone doesn’t quite grasp the rules, they can look up what information they need. It is a bit on the short side, which I found makes it great as a beer and pretzels game. You can finish one game in about 20 minutes (depending on how many players you have), and doesn’t really require a lot of brain power. With this one you can chat and laugh, without missing too much of what is happening during the game. It isn’t small enough to fit in my purse, but if I take it out of the box, it would be perfect to join my collection of games that we break out when we are at the pub. 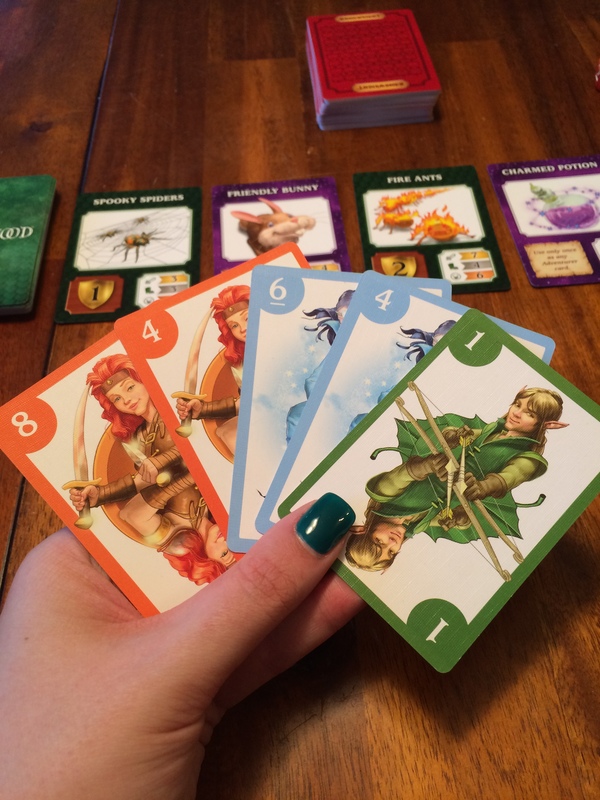 Mechanically, this game is all about hand management, with some light dice rolling involved. It isn’t a very complicated or strategic game, but you do have to manage your adventurers in order to take down the big creatures. Even then, you’re still vulnerable to the dice. Nothing is guaranteed; you’re just playing the odds that it will succeed. If you do end up failing a roll, you must discard one of your heroes making your next play that much more difficult. Yet despite the low level of strategy, I still found the game highly enjoyable. I will mention that the gameplay doesn’t quite carry the fantasy theme. Capturing creatures never felt as though I was in combat with them, it felt as though I was purchasing them, even though the outcome of the combat wasn’t guaranteed thanks to the dice rolling. In this sense it had a slight deck-building vibe to it. Event cards that are included in the landscape deck are a nice feature. They are included to mess with your strategy by making you give up your adventurer cards. It adds a nice element of uncertainty, as you never know when they will appear. However, there are only four in the deck, which I found a bit disappointing. I would have liked a few more, or the ability to increase the difficulty by adding more in. Components for Dragonwood are minimal. 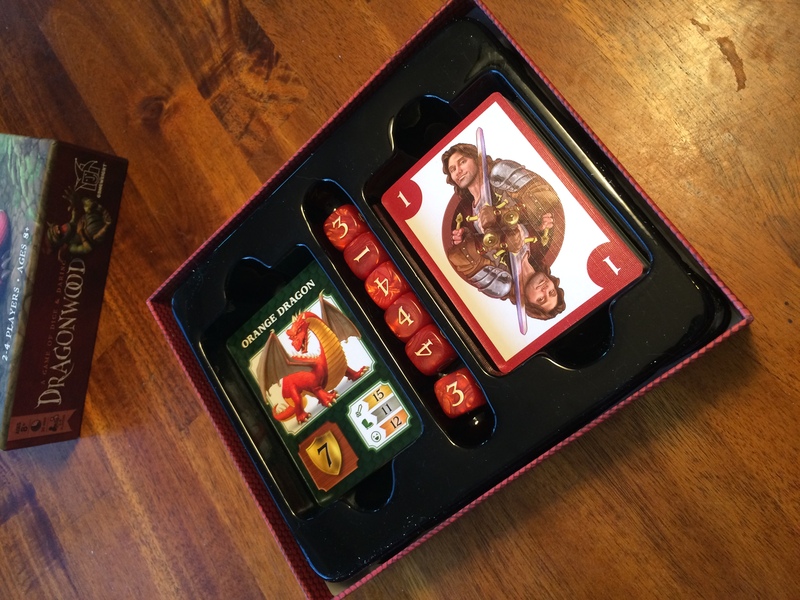 You get two decks of cards and 6 dice. Cards have a nice finish, with beautiful artwork. It is whimsical and enchanting, and really shows off the theme of the game. I just wish there was more of the artwork throughout! Worth noting, women characters are nicely represented. It is always good to see more than one female gracing the cards. I always play a rogue character when I roleplay, so I loved that the rogue in this game was a girl. Quality doesn’t stop with the cards. 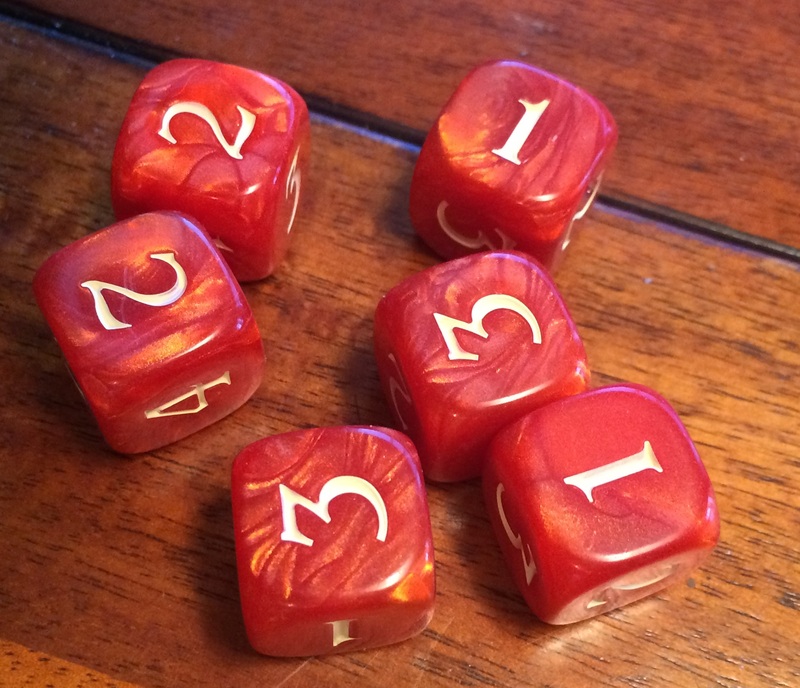 The dice are a red marbled color and the golden numbers are reminiscent of a sword and sorcery novel. Although it won’t fit in my purse, the insert holds all the components snugly, but allows them to easily be removed. The box itself is sturdy and durable, and and it too is covered with gorgeous artwork. Fitting with the theme and artwork was the rule book. It includes pictures and examples, with everything thoroughly explained, making it simple to read and understand. It also included variants to make the game longer, shorter, or with the addition of another spell. I can see this game getting repetitive in the long run, so the addition of the variants is welcome. 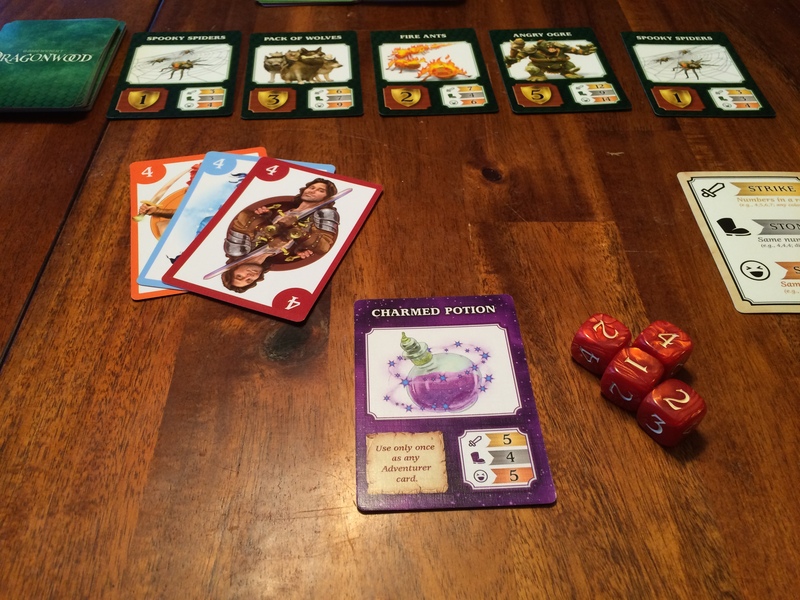 Dragonwood is whimsical, and fun, and it doesn’t take itself too seriously. I liked it for how light it was. It is a great addition to anyone’s collection as a small filler game that doesn’t take too much work and can be played between the big brain burners. Sometimes you just want to relax and kill some dragons! Being good for all ages also means that you can bring it out with the kids as well as the adults and everyone will have a great time. 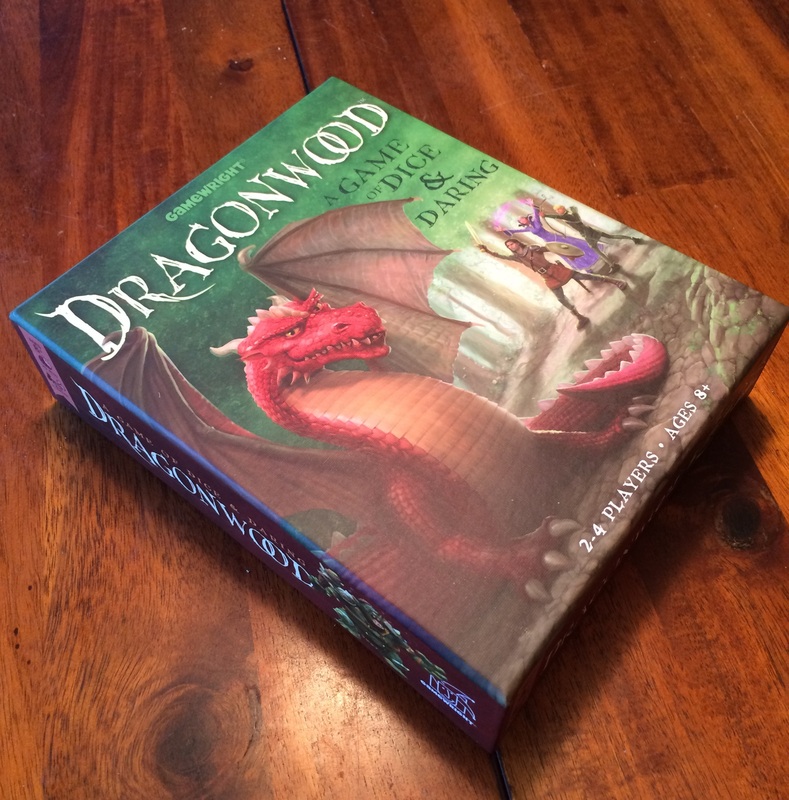 iSlaytheDragon would like to thank Gamewright Games for providing a review copy of Dragonwood.